On June 26th, the No. 4 ship ( 50,000 DWT Chemical/ Product Oil Tanker) built for Sinomarine Limited & Nanjing Tanker Corporation had been delivered on June 4th. 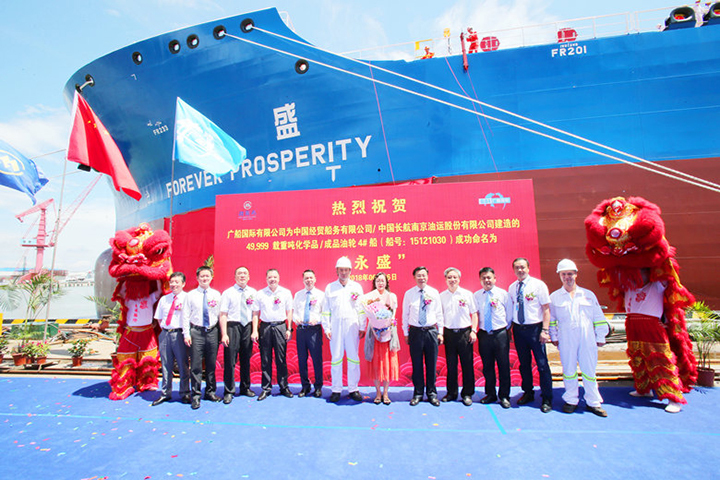 The vice-general manager from supervision department, Ms Zhang (Zhang Dongbo), named this ship as “Forever Prosperity”, and this ship is the last product of its series. On 30th of June, Sinotrans&CSC, CSTC and GSI signed and entered into force four ships’ construction contract. During the process of building ship, our company earned the affirmation and reputation from the shipowner within the high-technology and abundant experience. After the delivery of series ships, the shipowner continuously sent 2 commendatory letters to express their appreciation for affirming GSI made. It’s reported that this series is based on the existing 50,000-ton oil tanker designed and developed by the company with a total length of 183 meters, a width of 32 meters, a depth of 18 meters and a design draft of 11 meters,. Technical and environmental protection technologies have also been rationally optimized in terms of engine room layout, wind resistance, appearance and comfort, creating a new generation of advanced technology, low fuel consumption, new environmental protection and green ship type.